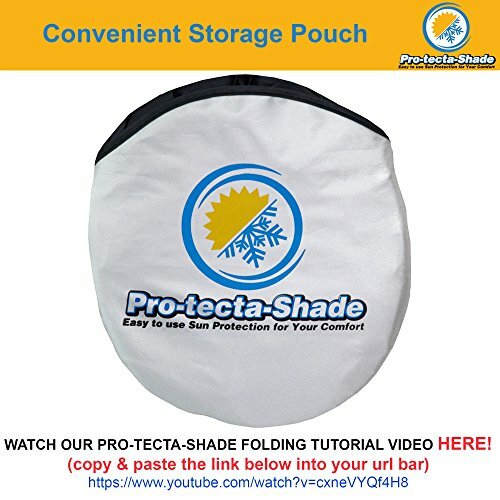 Winter or Summer... Pro-tecta-Shade Has You Covered! There's nothing worse than stepping into your vehicle on a scorching day. The burning seat, the hot steering wheel, the lack of oxygen...it's all there. 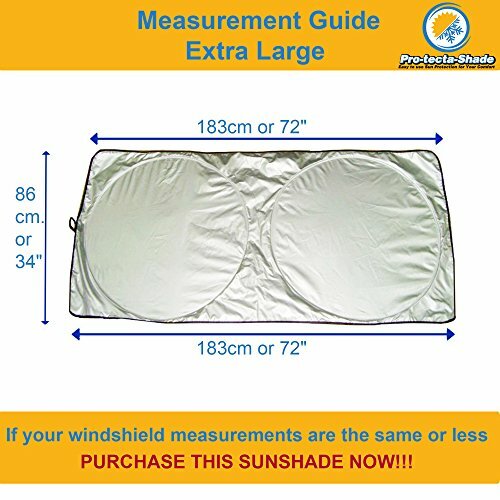 The inside of your vehicle is like a furnace and not only is it miserable to you, but the sun rays can do major damage to your car interior that can't be reversed! 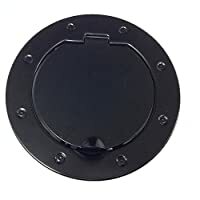 - Made from the highest and most durable reflective metallic nylon/polyester 210T material. This makes it thicker & of a more superior quality amongst all competition!
? 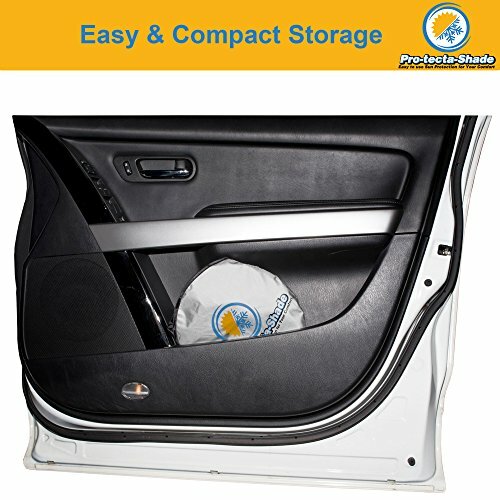 IS YOUR VEHICLE PROTECTED? 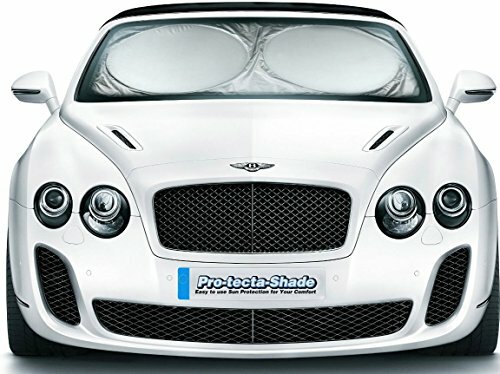 - Keep cooler during these hot summer months with the Pro-tecta-Shade Sun Shade. Our name say's it all - Our Shades Protect - GET PROTECTED TODAY! - No more, hot seats, hot steering wheel or magnifying sun ray's beaming down on your vehicle. ? STOP THE HEAT NOW! - THICKEST MATERIAL FOR THIS DESIGN - Our 210T material is thicker than similar sunshades out there. 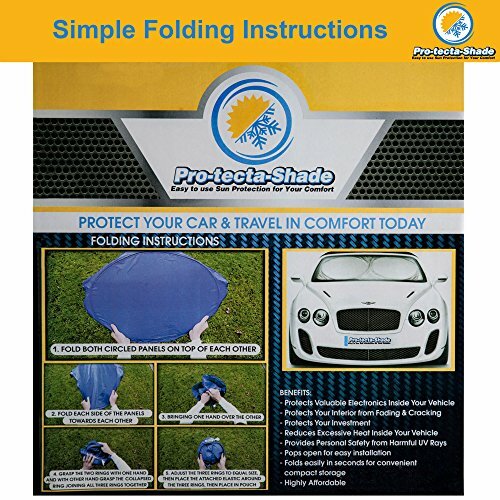 We guarantee our sunshades are made of the thickest nylon polyester material for this design (easily folds & pops open). Our design team have done multiple tests to provide you with the best quality material possible. 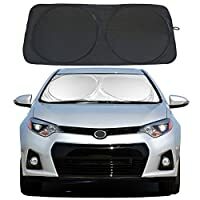 If the material was any thicker it would begin to crack more each time it's folded, meaning it will no longer protect you or your vehicle from the sun. ? 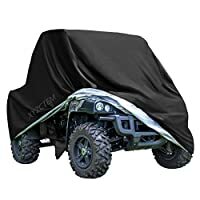 TWO SIZES OPTIONS TO FIT MOST VEHICLES - LARGE: Cover's Small, Medium & Large size vehicles (63in x 31.5in) or (160cm x 80cm) - EXTRA LARGE: Cover's Large sized SUV's, Vans and even big Trucks (72in x 33.9in) or (183cm x 86cm) - *NB: Please measure your windscreen to receive the best fit for your windshield. ? BONUS EXTRA'S - FREE GIFT: All Purpose Magic Towel Chamois/Shammy - ELASTIC FASTENERS: These attach to any sun visor & have been added to our design to enable a more snug fit to your windscreen (ONLY Sunshade with this feature) - EASY POP OPEN DESIGN and folds away just as quick. FREE ACCESS to Our FOLDING TUTORIAL VIDEO - (Copy & paste this link into your URL Bar to view our Folding Tutorial Video) https://www.youtube.com/watch?v=cxneVYQf4H8 ? 100% RISK FREE GUARANTEE - Our Pema LIVING Promise - Is to make life easier with affordable, high quality gear and 100% Risk Free User Satisfaction. 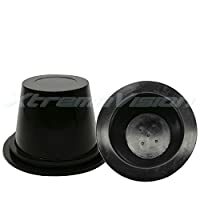 We hope you never have the need but if you do, feel free to contact us for a Hassle Free Replacement or Your Money Back.